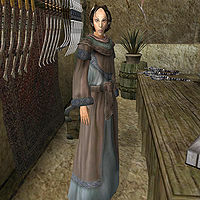 Area Effect Arrows adds a new shop selling a wide selection of quality Marksman weapons, all for sale at Aradraen's shop in the Lower Waistworks of Vivec's Foreign Quarter canton. The items added are available here and nowhere else, but fortunately, she has an unlimited supply. The projectiles included with this plugin are unique in that they will explode on impact, dealing fire, frost, shock or poison damage to any creatures or NPCs within range of the explosion. This page was last modified on 19 October 2018, at 21:28.